Everyone ages different as they get older. While some people are comfortable growing old gracefully, there are others who think there’s nothing graceful about it, fighting wrinkles and sagginess with everything they’ve got. Fortunately, you may have some worthwhile solutions to halt and reverse sign of aging in your refrigerator right now—in the form of citrus fruits, juices, and even vitamin C supplements. Citrus fruits– including oranges, lemons, and grapefruits—are loaded with vitamin C. This powerful antioxidant protects cells from damage by free radicals in the air and in our bodies. One way we can get the most benefits from citrus fruits is by eating them to increase our vitamin C consumption. Linked to numerous health benefits including improved brain health, fertility, heart health, and more, you should always keep a good supply of vitamin C rich citrus fruits around. 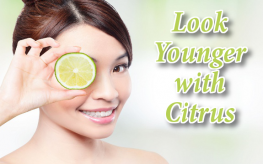 Vitamin C can also help by preventing wrinkles and fine lines from the inside out. As we age, the collagen under our skin begins to lose elasticity and begins to decrease in volume overall. This leads to wrinkles and lines. Vitamin C, like that found in citrus fruits, can help combat this process. In addition to eating them, these fruits can do remarkable things when used externally, or topically. Using lemon juice on age spots, you achieve a desirable, even skin tone and reduce those dark marks on your face or on the back of your hands. Simply dab the juice on daily and let sit for several minutes before rinsing off. The citric acid inside will help gradually fade the discolorations. You can even add vitamin C to your skin cream. Many moisturizers already contain vitamin C, but you can up the amount in your favorite moisturizer simply by adding a couple drops of lemon juice before massaging it in. This can help boost elasticity and collagen production in a matter of weeks. You only need to apply once daily for optimal benefits. Lemons in particular are a good citrus beauty treatment, and can be used on everything from acne spots to warts and dandruff (here are 10 ways to use lemons for beauty). Citrus, whether eaten or applied to the skin, can deliver numerous beauty and anti-aging benefits. For further tips on reversing signs of aging, check out NaturalSociety’s other post outlining 7 ways to stop aging in its tracks. You may also utilize exercise, turmeric, and aloe to halt the aging process.